Pint Night for Trails this Wednesday. Group Run @ 4:30 Pints @ 5-8:00! 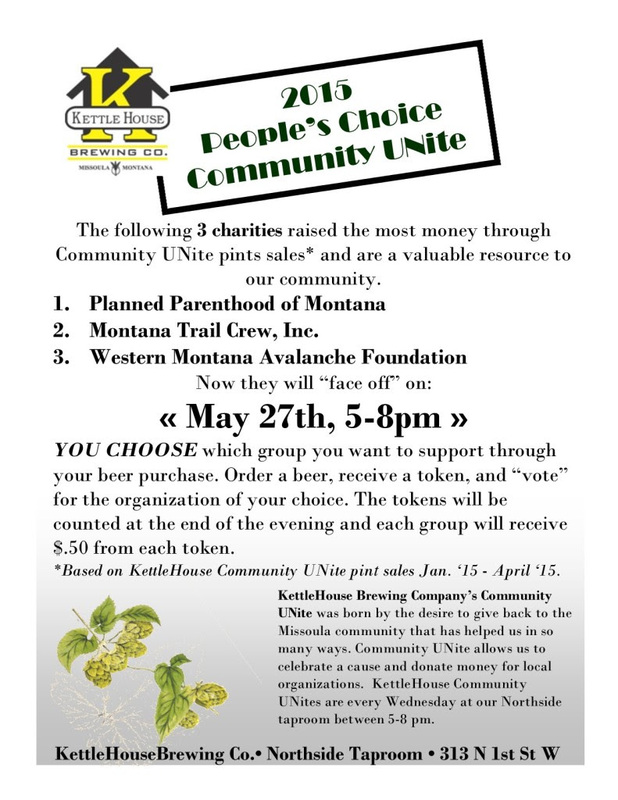 Come support Montana Trail Crew and the local trails this Wednesday evening at the Northside Kettlehouse for the People's Choice Pint Night. Join in beforehand for a casual run in the North Hills, where MTC has adopted a trail and initiated some trail work, followed by a pint or three with friends. 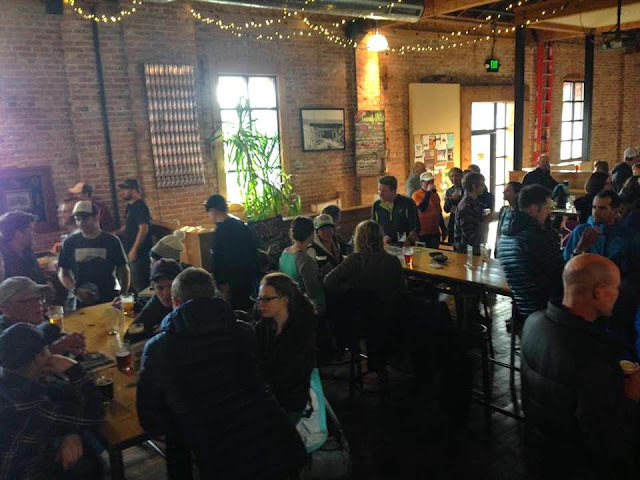 For every pint sold, Montana Trail Crew (patrons will choose what non-profit group receives the benefits) will receive $0.50 which will go directly to trail maintenance projects in our community. This will certainly be another great evening, so don't miss out! Run: 4:30 (keep an eye out for Jimmy or Seth). Everyone is welcome, no one is left behind. 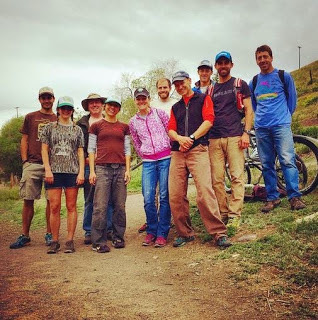 Women's Group Runs: Montana Trail Crew’s weekly women’s group runs are off to a great start this season. We will be meeting Tuesday mornings at 7am at various locations to explore some fun trails together. The runs are typically 1-hour in duration with approximately 500’-2000’ gain, and about 10-min/mile pace or less. If you are interested, please sign up for email notifications on our website and select the Women’s Group Run option. See you on the trails! Trail Work Opportunity: Milltown State Park is hosting a trail work day on June 6th. The project will lead to the establishment of a short connector trail from the park overlook off Deer Creek Road and extend to the old railroad grade along the Clark Fork River below. The project represents an important link for Missoula area runners who utilize the Kim Williams Trail. For more information click here. "Sunday marked the second annual Bozeman City Trail 10k and 5k. Put on by Schnee's in downtown Bozeman, this race put together an impressive string of trails, parks, and bike paths that ran from the foothills on the edge of town to the heart of Bozeman. The race didn't start until 1:00 so I spent the morning relaxing in the motel watching the rain. Eventually I put together my race kit, donned my rain jacket and went downtown to catch the bus to the start line. I had no idea where the buses were taking us, since I had never been to Bozeman before, and the map didn't really help since the rain had washed away any pertinent information. We unloaded as the sun finally broke through the clouds and I was able to warm up with sunglasses on. Just as we started though another wave of rain came through. The 10k started on a narrow two track that quickly dwindled to a single track path through rolling fields. Either because of the rain or some collective decision I missed, the pace went out very conservative. After a couple hundred meters I scooted to the front and ran the rest of the race alone. Footing was good although a little muddy in the bottom of the draws so tight turns deserved a little caution. The first couple miles of the course traversed the tops of the rolling hills before dropping and climbing to the next. One traversing section completely left the trail and we followed flags through the prairie grass, occasionally dodging gopher holes. As the course wound closer to town the single track gave way to a crushed gravel path that climbed to the top of Pete's Hill. After a short, screaming descent, the 10k course immediately went back up the hill and into a city park. Instead of following the sidewalk around the park, we went cross-country style following flags around the perimeter in the thick, wet grass. By the time the course left the park there was only about a mile left and the course finally hit pavement as it followed a deceptively slow bike path gradually uphill. After crossing a creek and another grassy park there were only a few blocks of pavement left to the finish. Solomon was on hand with great shwag and there was enough pizza and beer to satisfy any runner. If the day wasn't so rainy I'm sure it would have been a crowded after party. The course as a whole was a blast. Between the single track, mud, field grass, park grass and gravel, there was enough to keep you on your toes. The rolling hills also made it a challenging course that made it difficult despite the net downhill. It is definitely worth making the trip over to Bozeman for this race."